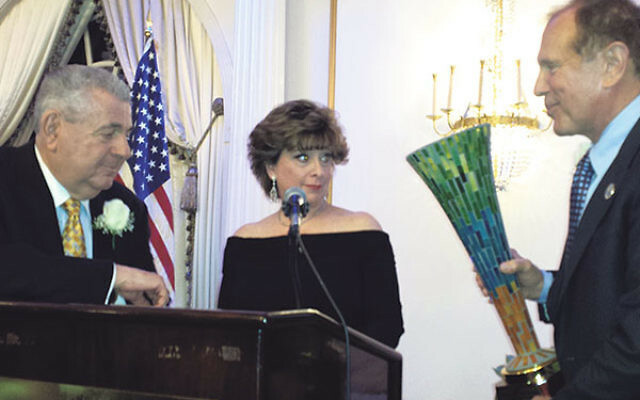 State Sen. Raymond Lesniak, right, presents the Patrons of Hope Award to Saul and Shelley Leighton. 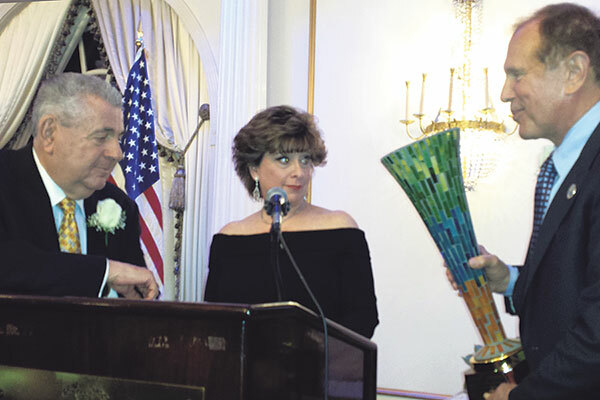 Those gathered for the annual Taste and Toast fund-raiser for the Jewish Vocational Service of MetroWest NJ included long-time supporters as well as newcomers who only recently discovered the work done by the agency. The honorees at the event, held June 22 at the Crystal Plaza in Livingston, included people from both groups: Patrons of Hope Award recipients Saul and Shelley Leighton, whose connection goes way back, and Young Leaders Award winner 14-year-old Allyson Stevens, who first heard of JVS five years ago. “I call it one of the region’s best-kept secrets,” one woman commented. Neither Jewish nor in financial need, as she said, she was astonished to find that the organization was happy to help her too in her efforts to deal with a son in need of support. The nonprofit organization, headquartered in East Orange but due to move into new premises soon, is a beneficiary agency of the Jewish Federation of Greater MetroWest NJ. It was founded 75 years ago, and now provides vocational and rehabilitation services on a nonsectarian basis to nearly 20,000 people a year. Allyson, who lives in Randolph, accompanied her mother to a meeting when she was nine, and heard how JVS helps people with disabilities find work (as it does for the fully able too) and develop their independence. She asked if she could help. Since then, by writing letters (“not very successfully”) and making personal appeals (much more successfully), and with the help of friends, she has raised thousands of dollars for JVS, and has volunteered at the agency’s events. In her remaining free time, Allyson babysits a disabled child and works with St. Hubert’s Animal Welfare Center in Madison. In her brief speech, delivered with the grace of a seasoned philanthropist, she talked about the importance of what JVS does, helping people with disabilities deal with the challenges of work and daily life. The Leightons received their award from State Sen. Raymond Lesniak (D-Dist. 20) and were introduced by Saul’s son Fred. His father has also volunteered extensively with Jewish National Fund and the American Cancer Society. Addressing the crowd of around 300 people, Saul, the founder of Bayway World of Liquors in Elizabeth, cited anthropologist Margaret Mead’s comment that it is the efforts of small groups of people that bring about change in the world. Michael Goldberg, succeeding Sid Seligman as president of the JVS board of trustees, is a relative newcomer; he got involved 10 years ago and since then has served in many volunteer positions. He was given the Special Recognition Award. Robin Fox was the evening’s emcee. She kept the room laughing as the donation pledges began to roll in, coming within about $30,000 of the goal of $350,000 — with donations expected to continue to be sent in. She turned serious, thanking the individual and corporate supporters, among them Ernst & Young, which received the Corporate Partner Award, in recognition of its years of support for JVS, both in dollars and volunteer time.